Traditional zero-turn riding mowers are often vital to a commercial landscaper’s equipment fleet. However, sometimes a commercial-grade mower is needed but a riding mower is not suitable for the job. That’s where the Scag SWZ comes in. With a simple, efficient design, the SWZ provides commercial-grade durability and performance in a walk-behind mower. 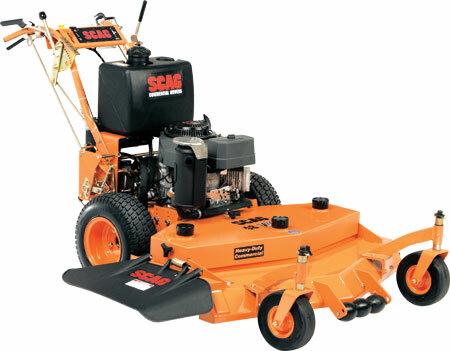 While it is a walk-behind mower, the SWZ has a commercial heavy-duty build like its other siblings in the Scag family. The 52-inch and 61-inch cutter decks are constructed of a 10-gauge steel top and a 7-gauge steel side skirt. These heavy-duty decks are also available in 36-inch and 48-inch widths constructed with 7-gauge steel. Adjust the cutter deck’s fixed height in ¼” increments from 1 ¾” to 4 ½”. The spindle assembly is tough featuring tapered roller bearings and a cast iron housing. Several features help to reduce maintenance and improve performance on the SWZ. Large drive tires with radius edges give better floatation and lessen turf tearing. A nylon hydraulic reservoir featuring a large surface area keep temperatures low during operation. With a self-adjusting hydro transmission belt and flat-free front caster tires, you can spend less time maintaining and repairing and more time on the job. The SWZ is powered by one of several available Kawasaki engines with electric start on some models. Complete the job fast with productive ground speeds up to 7.4 mph. The blades are engaged and disengaged with a dependable Ogura clutch. Start the SWZ easier in colder temperatures with a de-clutch cold-start feature. Operator controls are placed conveniently for ease of operation. The instrument panel features key, choke, throttle, and PTO engagement switch. Adjust-A-Trac is mounted on the engine deck for fast, easy neutral and tracking adjustments on the job. Controls also include a parking brake and a forward speed lever. The SWZ gives you the commercial quality of a Scag riding mower with the convenience of a walk-behind. Regular maintenance parts like belts, filters, and spark plugs are available at ScagOEMParts.com Find OEM replacement parts for the SWZ using the handy online parts lookup option.